Filed under Star Wars; 2 comments. A new Star Wars movie used to be a thrice-in-a-generation event. This summer's The Clone Wars has broken that tradition, and no one seems too happy about it. With only a 20% rating on aggregate review site Rotten Tomatoes. It continues a trend of anti-Star Wars sentiment that began in 1999 when young Anakin Skywalker first debuted as a podracing slave who, with a battle cry of "Yahoo! ", miraculously saved the day. I've not seen George Lucas' new animated entry into this storied series, but I do wish to take exception with those who suggest it's the fourth consecutive instance of the distant galaxy's creator flushing the franchise down the drain. Sure, the bar was set high, with Episodes IV and V earning an average rating of 96%, again on Rotten Tomatoes. But Return of the Jedi sunk to 74%, which provides good company for the three prequels, which garnered 63%, 66%, and 79%, respectively. Even without comparing the prequels to their older siblings, there's still much to like. I won't dispute the obvious, like Jar-Jar's presence making light of a trilogy that, by its very subject matter, should be dark. But too often, the hate that is harped on these brilliant examples of all that is wrong with Star Wars overpowers the moments that truly shine. Take Attack of the Clones which ends with a battle that's worth the previous two hours. Before then, we'd only ever known the galaxy's oldest Jedi as a shriveled Muppet on his death bed. Here, we learn Yoda is a force (no pun intended) to be reckoned with on so many levels. 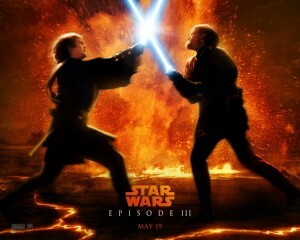 That is one of only several jaw-dropping lightsaber battles to grace the trilogy. Whereas Jedi were scarce in the original films, Episodes I-III brought them out en masse. The Phantom Menace gave us the excellent music and choreography of "Duel of the Fates". Not only was the battle set to a song I always wished to be in the choir for, but it was the first battle against a prequel-exclusive Sith lord — and one equipped with a heretofore-unknown variation on the light saber! Now that's how to kick it up a notch. Remember this? I thought so. Compared to that single struggle, Revenge of the Sith was a smorgasbord of skirmishes, with at least five lightsaber battles among the greatest heroes and villains of the entire six-episode epic. In the prequel's conclusion, not only had Anakin Skywalker grown up, but so had Hayden Christensen, with a portrayal of young Vader that was less whiny and more ambitious than we'd previously seen. It makes his perfect manipulation at the hands of Darth Sidious all the more painful to watch. Watching Revenge of the Sith was like watching Titanic: a tragedy that you knew couldn't be averted, but you hoped would nonetheless be derailed and fail to play out. I took me days to realize the extent of Palpatine's machinations, and at least a week to recover from my depression over his success. I mentioned this to a friend of mine, who laughed, saying he'd never considered the possibility that someone could be depressed over a movie. But taken in the larger context of what these three movies did to the Star Wars universe and the stage they set for Episodes IV-VI, I can conceive of no other response. To this day, I can't bring myself to endure that experience again. We've already commemorated the impact made by the original trilogy's simple yet stellar tale of good vs. evil. The prequels are more complex, in where they were coming from, where they had to get to, and audience reception and interpretation. I submit that among those variables are many kernels of quality. Another site offers 11 concrete reasons for that supposition; I encourage you to rewatch the films and come up with your own. I agree that while the original Star Wars trilogy will always have a special place in our hearts because of nostalgia and the age we were when it was first released, the prequels (and "expanded universe" of novels, games, etc.) ventured into darker territory while at the same time trying to entertain children rather than us fanboys exclusively. That's not to say that the prequels were without fault, but I appreciate George Lucas' creative vision and control over his space opera. If you haven't already, I also recommend the animated Clone Wars shorts and TV series. They're heavily stylized, but still entertaining. I liked the line a smorgasbord of skirmishes. I guess while the Star Wars hunger is there somebody will try to satisfy it. At least there is another course to sup on however unsatisying it might be.